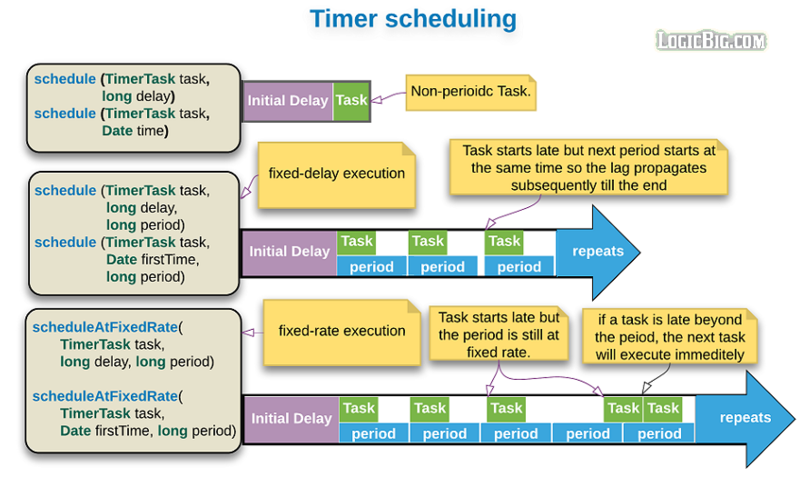 java.util.Timer provides a way to schedule the tasks (one or more tasks). Timer starts a new background thread and executes the submitted tasks in that new thread. The timer can repeat the tasks periodically based on a provided time period. This class is thread-safe, i.e. multiple threads can use a single Timer object without taking care of synchronization themselves. The overloaded Timer constructors just take trivial info i.e. timer's name and isDaemon. There's a no arg constructor available as well. The moment we call one of the above schedule methods, timer wait for the initial delay before executing the task. Start of each period is always recorded at the beginning of each task execution. Subsequent tasks are scheduled at the end of each period. If an execution is delayed for any reason (such as garbage collection or other o.s. activity, the start of the corresponding period is also delayed. Task execution itself should be very quick, possibly of few milli-seconds. In case if tasks run longer than specified period, they will execute immediately after one another. These methods should be used where frequency of some task is important e.g. blinking of a cursor etc. Start of each period is recorded consecutively without any delay, regardless of if a task starts late (because of JVM or O.S activities). These methods should be used where absolute timing is important e.g. sending some message every hour, archiving log files at end of the week etc. - and has only one abstract method run(), which executes our provided task. When a Timer instance is created, a background thread is created and started i.e. it's start() method is called. This thread is a Timer's nested class: TimerThread (we don't have to remember the name by the way, we mentioned it for further explanation and as a convenient reference on this page). This new spawned thread monitors (poll) a queue containing submitted task. That means all tasks are executed sequentially within the same thread (TimerThread). Tasks should finish quickly, otherwise it will delay the execution of subsequent tasks. If a task might take a long time (longer than provided delay or periodicity) then we should spawn a new thread within the task's run() method. By default, the TaskThread instance does not run as a daemon thread, so it will keep an application from terminating even all task finish executing. If we want to terminate a timer execution thread immediately, Timer#cancel() must be called. For the same instance of Timer there's only one background thread (TimerThread), which will handle all Timer's schedule method calls. That means all tasks will run sequentially.